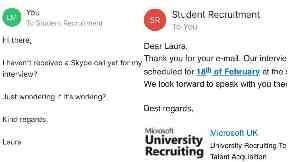 Laura MacLean from Dingwall thought her Microsoft interview was scheduled for January. A student who accidentally showed up a month early for an interview with Microsoft has gone viral after sharing her email exchanges with the company over the mix up. Laura MacLean from Dingwall is currently studying management with marketing at Robert Gordon University in Aberdeen and applied for the 12-month placement with the company. "I was so eager to get it because Microsoft are a huge company and to gain practical work experience at a company of that size would be invaluable," Laura explains. 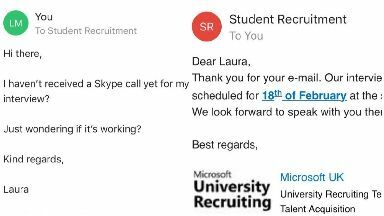 However Laura's eagerness to get the role led her to turn up a whole month early for her Skype interview on January 18, rather than on February 18. "I pride myself in being very prepared and an organised person ironically, " she said. "I had been studying everything I could about Microsoft every single day that week and had got my parents, siblings and anyone I could grab hold of to mock interview me, in-person and over Skype most nights. 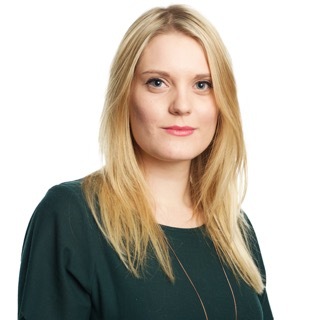 "I didn't want to mess up my one chance as I knew the placement opportunity at Microsoft would be amazing for me to gain a deeper insight into marketing - and these type of chances don't come around often with big tech companies like Microsoft." The 21-year-old said she woke up early on Friday to prepare for the interview, getting changed into smart clothes and doing extra preparations for the call scheduled for 11am. However, when the phone didn't ring, Laura began to panic. 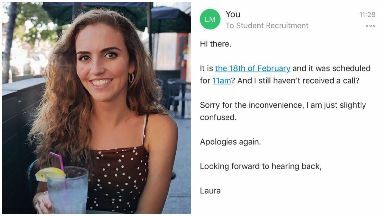 She emailed the recruitment team, who reminded her the interview was scheduled for a month's time but she still didn't understand her mistake. 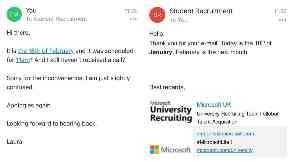 "After emailing the recruiting team informing them it was 'the 18th of February', even although it clearly was not, I called my step dad and explained the emails up until this point that the recruiting team had sent me and told him how confused I was. "Much to my humiliation, my stepdad went 'Laura, it's the 18th of January today, not February' and burst out laughing for a good few minutes. "What made it all worse was that my birthday is February 14, so somehow I had managed to skip turning 22." Worried she had ruined her chance of getting the role, she apologised to the Microsoft recruitment team for her mistake. "Thankfully, much to my relief, the team were so so lovely and replied back to me saying that it was no problem and that 'mistakes happen'." Since then, Laura has posted the email exchange on Twitter which had amassed more than 185,000 likes and almost 35,000 retweets. Sympathetic Twitter users have told Laura about their own employment mishaps, which have made the student feel less alone following her blunder. "People have been so lovely about the situation - I've had so many people around the world telling me about their similar situations and it's been a great consolation. "I'm delighted to know I'm not alone!" Looking forward to her actual interview in a month's time, Laura hopes that her eagerness will help her land the job. "I really hope that they see the humorous side to the ordeal and that I have an intense dedication to punctuality - albeit a little too good."